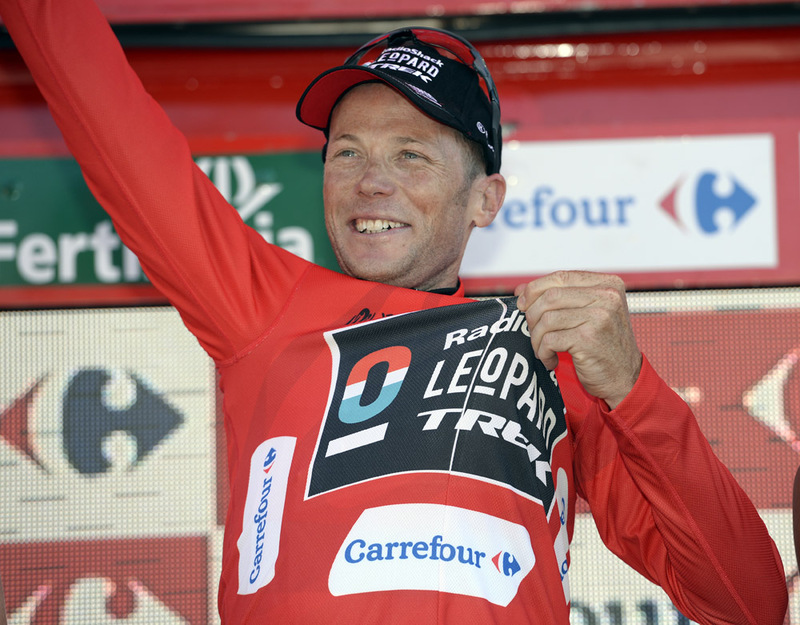 Chris Horner (RadioShack-Leopard) took his second stage win of the 2013 Vuelta a Espana on Monday, winning the key mountain stage to Alto Hazallanas and putting himself back into the overall lead. Horner attacked an elite group of favourites on the final five kilometres of the steep finishing climb to quickly distance his rivals. Vincenzo Nibali (Astana) put in a chase in the last two kilometres, but could only match the American’s pace rather than catch him. Alejandro Valverde (Movistar) came in for third place, heading a small group of favourites. The overall classification has once again been shaken up: Horner leads Nibali by 44 seconds, with Roche in third at 53 seconds. It’s a satisfying outcome for 41-year-old Horner, having taken the race lead after winning stage three only to lose it the following day after being on the wrong side of a small split in the peloton at the finish. The 10-rider escape group kept together until the ascent of the first category Alto de Monachil in hot conditions, which whittled down the group to just Tomasz Marczynski (Vacansoleil-DCM), Diego Ulissi (Lampre-Merida) and Georg Preidler (Argos-Shimano). Ulissi then got distanced on the descent but regained contact when the road reared up. Behind, a blistering pace set by Fabian Cancellara for RadioShack-Leopard on the Monachil had splintered the bunch to pieces. At the base of the final climb of Alto de Hazallanas, the peloton consisted of a select group of favourites and their key team helpers. Inside the final 10km, Marczynski was alone out front as Preidler and Ulissi were caught by the bunch. Marczynski valiantly held on until the final 5km, when an upping of the pace by Astana susequently launched Vincenzo Nibali (Astana), Ivan Basso (Cannondale), Chris Horner (RadioShack-Leopard) and Joaquim Rodriguez (Katusha). Horner was the first to attack, a move which seemingly allowed Thibaut Pinot (FDJ), Nicolas Roche (Saxo-Tinkoff) and Alejandro Valverde (Movistar) to regain contact. As Horner forged ahead, pushing out his advantage to just under 50 seconds, Nibali attacked the chasers with 2km to go. Hard as he pushed on, Nibali couldn’t make any headway into Horner’s gap and the American crossed the line with 48 seconds to spare over the Italian. Sky were one of the teams that didn’t fare well on the stage, with overall hopefuls Rigoberto Uran and Sergio Henao coming home in 26th and 27th positions. Uran is now out of the top ten, in 15th spot and over five minutes adrift of Horner. A big crash in the neutralised zone before the stage start proper saw several riders forced to abandon the race with their injuries. Bart De Clercq (Lotto), Guillaume Boivin (Cannondale), Alberto Losada (Katusha) and Barry Markus (Vacansoleil) all withdrawing. Also out of the race were British rider Andy Fenn (Omega Pharma-QuickStep) and Thomas De Gendt (Vacansoleil-DCM), who were disqualified for allegedly holding onto a team car. Tomorrow (Tuesday) the riders enjoy their first rest day of the 2013 Vuelta a Espana.